When I was a kid I wouldn’t have been caught dead at a flea market, now that I am older, I love shopping at them. I can remember as a pre-teen hearing the term “flea market” and wondering why there was a market that would have fleas! So why is a flea market called a flea market? The theory behind the name comes from “Fly Market” in 18th century New York City when the association began. The Dutch word Vlaie is spoken with the v being pronounced f, which means swamp or valley. This market’s location was at Maiden Lane near the East River in Manhattan. Different English speaking countries used different names for flea markets. In Australian English, they are called trash and treasure markets, trash and trivia, or swap meets. In the Philippine English, the word is tiangge, which is said to be a loan word from Hokkien spoken by Chinese Filipino migrants. 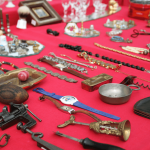 A flea market is a type of bazaar where secondhand, or new, usually cheap goods are sold or bartered. Some flea markets are indoors such as in a warehouse, and some are outdoors in a field or under a tent. The vendors at the flea market can be a combination of a family renting a table to sell a few unwanted household items to a commercial operation. Many flea markets have food vendors who sell snacks and drinks. 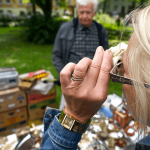 If you have never visited a flea market, it is an experience you will always remember. You can certainly come home with some great little treasures, but you may see all kinds of people. I have been to a flea market in Murphy, NC that has two parts with a highway in between. On one side of the flea market, there is a small zoo. This market is one place that when I visit, I always think of Jeff Foxworthy and his “You might be a redneck” jokes. Every time I go, I see real rednecks. I have heard and ready several funny stories about flea markets all around the United States. I will now share a few of those. I know a lady that went to a local flea market to look for a folding chair for her daughter’s Girl Scout troop meeting place. Most of the chairs she saw were not very durable, and some were rusty, but she did come across one that caught her eye because it looked better than the others. An old man came over, and she asked him how much he wanted for the chair. He said he had some more in the back and he would sell it and more like them for $5 each. You would think you would have to sink pretty low get thrown out of a flea market, but this lady took it well. She could have argued and told the man that the chair was rusty and not worth $5, but she just figured he was a grouchy old man who thinks he is always right. He could have just told her that he stood firm on his price, instead of shooing her away. After all, at flea markets you usually barter. This same lady says that she used to shop at a flea market that is now closed, but when it was open, she could barter with those owners. The owners were a couple that bought things from storage places that people would let go of or put in home sales. This couple’s flea market items decorate her whole house, she claims. I heard another story about a woman that got up at 6:30 on a Saturday morning to go to the second flea market she had ever been to in her life. One of the funny things about this is that the name of the flea market was “2nd Saturdayz Market”. It, of course, was only open every 2nd Saturday of the month. She was one of the first to arrive and talked to some experienced flea market shoppers who shared their secrets with her. A few of the other females had their husbands with them, and the husbands would load the cars while they continued shopping. While waiting in line for the market to open, someone noticed that this lady did not have a bag and ran to her car to get her one. The people she met and got her a bag told their flea market secrets while they all waited in line for an hour before the doors even opened! A few minutes before the doors were open, a young lady came out and started handing out gift baskets to the first 20 people in line, and she was one of the 20. Those 20 people kept taking turns running to their cars to drop off the basket of goodies shortly after the doors opened. Some of the vendors she visited were Garden Party, John Bob Cool Junk, and Whimsical Whites. One of the items she picked up was a yellow Coca-Cola crate. She then told the vendor that she did not realize it was a tea towel; she thought it was a table runner. The man said, “It’s a very large tea towel, and you are robbing me blind!” She then offered to pay the extra 25 cents. She said, “This is all just a ruse to get me to buy a beer, isn’t it?” He told her he was busted, but not to let them put ice on the beer. So she bought a 50 cent towel with a four dollar beer because she felt guilty for getting a 25 cent discount! I heard another funny story about a lady that wanted to introduce her friend to South Carolina. The friend was from Vermont. Nothing captures the unique culture of South Carolina more than a flea market. They went to the flea market and found honey sticks, muscadines that were not ripe, yellow root sticks, Yogi bedtime tea, and garam masala. Once they got past the haze of cigarette smoke and fried pork skin fumes, they could see promising little treasures. Some of the things they did not buy but saw were baby turtles, exotic chickens, boiled peanuts, eucalyptus plant, and a frightening mole trap. The mole trap actually came with a demonstration of how it worked. 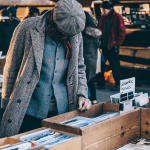 One thing is for sure, if you start going to flea markets or have friends that go regularly, you are bound to come back with some funny stories or hear some. You will probably also come across some unique items and great deals.